Marguerite Cruises create a completely enjoyable experience for you in Halong Bay with a professional crew, excellent customer care and cozy but spacious rooms. Enjoy the spectacular view of Halong Bay day and night through wide windows. Either an energizing day full of activities, or spend your time emerging with the world heritage site beauty, watching the sunset while sipping Hanoi beer or Vietnamese coffee, Marguerite always offers you choices. A pick up at your central hotel for 3,5 hour drive to Halong Bay. 12:15 Transfer by tender to the Marguerite Junk boat – enjoy Welcome Drink. Receive Junk Facilities and Cruise Instruction as well as Cruise Briefing before check in to cabins and begin cruise Off the Bitten Track. 15.00 Arrive at Titop Island Area. Transfer to Titop Island by tender. Enjoy swimming, relaxing on the beach and climbing the steps to the top of the mountain on the island for gorgeous views and photo opportunities for 45 minutes. 15.45 Transfer back to the boat and sail for approximately 45 minutes to Bat Cave area. 16.30 Arrive at the Bat Cave area. Enjoy 01 hour kayaking program to the nearby Bat Cave, lagoon and surrounding waters. Or visit the largest floating fishing village in Halong Bay by tender and tour the village for 20 minutes. 18:00 Cruise to the area to anchor for overnight. 20:30 Evening activities include: film entertainment in the dining room, board games and playing cards are available, join squid fishing from the boat with our crew. 21:00 – 23:00 Happy Hour! Buy two drinks - get one free. 6:45 Coffee, tea and light breakfast pastries served in the dining room. 8:00 Walk up the 100 steps to the entrance of the cave and tour on foot for approximately 45 minutes. 9:00 Return to the boat take time to freshen up and relax. 10:30 Check-out of cabins. Enjoy Brunch Set Menu or Buffet served in the dining room while enjoy the bay scenery as we approach the pier. 11:30 Transfer by tender to the pier, relax inside the pier building while waiting for return transportation. Reach Hanoi approximately at 5pm. 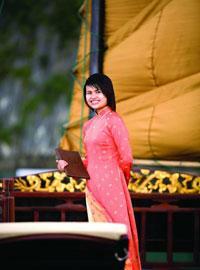 Drop off at your hotel and end of services by Indochina Travel Service. Marguerite Junk 1 offers 12 deluxe spacious fully-equipped rooms and Marguerite Junk 2 offers 9 rooms. Each room is well - designed, fully equipped and sized 18m2.